I think 8K is closer than we might think. Whether or not it's something that anyone actually needs is quite arguable, but in my opinion it's pretty clear where things are headed. I am sure that an 8K URSA Mini Pro is probably already being prototyped as we speak, and I have to wonder if the BlackmagicRAW codec was designed in large part to address the recording and playback needs of 8K raw footage. There is also this comment: https://www.redsharknews.com/business/i ... g-8k-video. As for 8K in general, that's going to require some hefty processing power, not just in-camera, but in the computer as well. Then you might need 8K monitor/s to work on the files and you'll also have a major issue with storage, both in-camera and computer. Also, don't forget about stabilisation, 8K is going to require far more camera stability than 4K, or you'll be shooting at much higher shutter speeds (or whatever the shutter angle will be). If delivery standards move from HD/2k to 4k then 8k capture will be a necessity to provide optimal resolution from oversampling on high end projects. I guess on current processing hardware more reliance on proxy editing will have to be the norm. You don't need 8K monitors just to work with 8K footage, any more than we needed 8K monitors to work with larger than 8K images for all these years. The odds of any hybrids offering 8K VIDEO in the near future are pretty low. Not only is it not necessary, but the processing power required is huge. Cramming that into a hybrid with a data bus the can handle writing the required data rate is going to be an interesting challenge. There should be a very obvious correlation between the camera company that has the most efficient raw codec in the industry (in terms of space) and the camera company with the highest resolution cameras in the industry. And their price tags. Rakesh Malik wrote: You don't need 8K monitors just to work with 8K footage, any more than we needed 8K monitors to work with larger than 8K images for all these years. You may not 'need' and 8K monitor, but if you use large monitors, 1080p or 4K can look somewhat ordinary. I'm having that issue right now with one of my monitors. My main laptop's 17" screen looks great, but my 24" monitor at 1080p looks ordinary. I'm thinking of getting a higher resolution second monitor so they both match. Last edited by Australian Image on Wed Nov 28, 2018 9:08 pm, edited 1 time in total. You wanna know what'd be cool? 1,000,000,000 K. Now that's what I'm waiting on. I think I'll hold on to my money until then. 8k is overkill - even James Cameron is shooting the Avatar sequels on Sony VENICE cameras, and they are "only" 6k. I think BMD should make a UMP with a 6k full frame sensor, but that is just me. Personally I don't care about 8K. I don't even care about "full frame" or VistaVision as it's known in cinema, with the exception of being used for VFX. Not unless you get up to larger formats equivalent to 65mm do I care about higher resolution. And that's where it matters. So, if Blackmagic does go for 8K I think it should be for a large format sensor. But even then the glass options become more limited. I still say Blackmagic perfects the 4.6K sensor. Get more dynamic range and faster shutter readouts so that it's closer to global shutter. Maybe get 120 fps at full 4.6K sensor in the next URSA Mini and 240 fps in the next version of the URSA. Yes, I said URSA. Why, because that could still work as a monster camera that can be capable of more power. Either way, I am fine with 4.6K for now. BTW most cinemas don't go above 4K. TVs are UHD 4K, and many people have still yet to update. So 8K is just a marketing gimmick at this time that the general audience doesn't care about. timbutt2 wrote: BTW most cinemas don't go above 4K. TVs are UHD 4K, and many people have still yet to update. So 8K is just a marketing gimmick at this time that the general audience doesn't care about. We don't even have that, ours is 1080p and most of our broadcast TV is 720p. To me 8K is overkill. Not only processing power of the computer, the need to have more space for storage. 8K is 4 times 4K, so it's not a joke. Ursa Mini Pro is perfect with 4.6K. It can, maybe, go up to 6K with a full-frame sensor as an option. I strongly suspect it's not 8K, but a Ursa Mini with lowlight capability (dual sensitivity sensor like the BMPCC 4K) is the new camera that BMD would announce next year. BMD never ceases to surprise us, so I might be wrong all together. Considering we've been watching films shot on Alexa (2K), in cinema, for the past 8 years, I don't see much point it 4K. Not even mentioning 8K. It's funny, because even in 2009 people were asking the same question about 1080p and was 720p good enough. People were thinking 1080p was overkill—but what changed that? The 5D Mark ii and the 7D—and h264 as well—for as crappy as it is. I suspect people will be watching 4k for a while—and many don't even have 4K TV's. But, their phones and tablets show anywhere from 1080p to 3K, so this time around it might be retina screens again pushing it forward. I shoot 4K, but I deliver 1080p. If I watch anything in 4K, it's just for me—not my clients. But there will be a time when I may be finishing in 4K (hopefully not anytime soon) and 8K would be needed to continue my post crop/reframing I do with interviews. BMD already sells 8K hardware, so why wouldn't they? RED moves a lot of 8K sensors in both 30mm wide and what, 42mm wide formats? Not so much because users have 8K displays (though some do), but because it gives more options for reframing and oversampling. Ximea has a new camera using the GPixel GMAX3265 sensor. Can do 9.3K/12b/60fps, 9.3k/10b/120fps, 8K/12b/80fps. All global shutter. 30mm wide, so about what the RED Helium is. So maybe a 30mm wide sensor is what would make sense for BMD too? Simplified a lot of the lens issues. To keep costs low and get to market faster, they could make a hybrid camera that only could record 8K raw and all other formats at 4K. 4K only SDI monitoring too. Basically acts like a 4K camera until you open the raw files. Resolve could be updated to convert 8K raw files into 4K RGB. Would minimize the post production issues for users who are only interested in 8K for 4K. Completely unrelated, but 8K sensors can also be used to make 4K cameras that have expanded gamut or dynamic range or for depth estimation (think a professional version of a "portrait mode" on a modern flagship smartphone). And how do you want to get 8K raw to disk realtime?? For the UMP in some recordings you need 2 drives together to handle the writespeeds.. So what about 8K raw? I dont know how RED does it.. I do know there drives are insanly expensive..
Are you able to record 30 minutes in 8K with a Red? or only 30 second clips in buffer and then it needs to write to card... Dont know.. No Red knowlage..
Xtreemtec wrote: I dont know how RED does it.. I do know there drives are insanly expensive..
RED does that with Redcode. Basically every RED camera records no more than 300 MB/s: the more resolution or FPS you need, the higher with compression you have to go. You can record bursts with higher throughput, but in real life nobody does that. So, for example, half an hour in 8K at 24fps takes about 450GB at 260 MB/s compressed 5:1, which is perfectly playable with any SSD nowdays. Of course recording is only allowed on RED media (you can record on PC via Ethernet tether, but you're capped with 1000mbps limit, which is 120MB/s, and that's another story), ...but when playing on PC drive speed isn't the bottleneck. Last edited by Fabio Lanzone on Thu Nov 29, 2018 5:15 pm, edited 1 time in total. Thanks Fabio for this explanation on Red.. Wasn't aware of Red doing compression to get it out to disk. Xtreemtec wrote: Thanks Fabio for this explanation on Red.. Wasn't aware of Red doing compression to get it out to disk. Even if you wanted to record uncompressed at a high framerate you could do it with off the shelf NAND packages. I record directly to a RAID 0 array of Samsung 970 Pros. Each array is 8TB and can record uncompressed raw at about 10GB/s, which is good enough for 8K @ 120fps @ 12bpp. About 20 minutes worth, but small and cheap enough to pack several. At 24fps, you'd get 100 minutes, so still plenty usable without having to swap media out. The price/performance/compactness of M.2 NVMe is amazing and it's getting better. If BMD chose NVMe PCIe as a recording solution (instead of a SATA c-fast array), they could get some interesting options. The M.2 format isn't designed for insertion cycles, but you could make an enclosure that used a more rugged connector and acted as a heatsink. EDIT: All that speed is also nice when you want to dump it off on the computer. Even if you shot @24, you could read 100 minutes of footage off in less than 15 minutes real time (as the read speeds are like 14GB/s). If you have a the right components, the transfers can be done from the M.2 to the server entirely via DMA. For broad compatibility, though, you might want the option of doing TB3 transfers. Slower, but means you can do it pretty much on any system without much effort. Heck the USB3 connector could be built into the media itself, so it's just standard cable and you're done. “I can be wrong” but few people on this forum are in a position to be an early innovator of 11K acquisition for 8K delivery. That’s why I speculated about a year ago that the next leap we would see from BMD would be a 6144x3456 sensor (for 4K delivery). If I’m wrong about 6K, a BMD 8K sensor could be Vistavision in size and present implementation challenges. When you’re playing hockey, it’s smart to skate to where the puck is going. But most of us that might try that wouldn’t have a client or audience that can play the game that way. You need around 1.5 times the horizontal resolution with a bayer sensor(and OLPF) to deliver a sharp de-bayered output. 6k bayer => 4k output de-bayered. (Sony Venice, Canon C700, Red Dragon 6k). 12k bayer => 8k output de-bayered. My hopes are that the new camera's will be equiped with a s35 6k bayer sensor and a FF35 6k bayer sensor. For a 12k bayer sensor you just need to much GPU-power. With small sensors and high resolutions you run into diffraction problems soon and you will also need lenses which are very expensive. For 6k with a s35 sensor you already need a super lens like the Zeiss Otus 85 mm set to F4 to get enough resolving power. So a FF35 mm 6k would be the best and cheapest option for film makers (lots of lenses). I'm okay with 6K horizontal resolution at S35, but with an increase in vertical resolution and size as well to get a perfect 4-perf 35mm film gauge size. This means that the sensor would have to be 4:3 or 1.33:1. Why do this? For better anamorphic shooting. RED builds their 6K sensor at 6144 × 3240, which is a 1.89:1 aspect ratio. Going off the 6144 horizontal size we can then say that 4608 would be the vertical sensor size needed to get a 4-perf (1.33:1) aspect ratio. This resolution would have to fit in a 21.95mm X 18.6mm sensor to be properly equivalent to the 4-perf CinemaScope film. 21.95mm X 18.6mm is actually 1.18:1 for an aspect ratio, but when used with a 2X Anamorphic Lens and desqueezed becomes 2.35:1 for all intents and purposes. So, since the 4.6K has 25.34mm X 14.25mm for it's sensor size I think we can keep the current width. This means the sensor would become 25.34mm X 21.12mm to have a 1.2:1 aspect ratio to desqueeze to 2.4:1, which keeps things simple. That means 6,144 pixels need to fit into 25.34mm and 5,120 pixels would have need to fit into 21.12mm. Or... we could keep 4,608 at 25.34mm and go with 3,456 at 19.00mm to achieve a 4:3 sensor that can shoot 4:3 and then crop for Anamorphic to be using only 22.8mm of the width (4,147 pixels) to keep 2.4:1 as the desqueeze aspect ratio. I prefer this idea. So, when it comes to changing the sensor size and resolution I care more about getting a true 4-perf vertical height to match film and to get the vertical resolution higher. I'm fine with 4.6K, but am okay if we go to 6K purely for better resolution options on the true 4-perf 35mm size sensor. Xtreemtec wrote: And how do you want to get 8K raw to disk realtime?? As I mentioned, I suspect Blackmagic unveiled their new RAW format with the future in mind and not the past. The data rates of compressed BlackmagicRAW make 8K a viable option on a C-Fast 2.0 or USB 3.1 SSD. This is not really about the legitimate need for 8K vs. the fact that the industry is moving that way regardless (like they did for 4K). I'm sure at the next NAB, 8K will be quite present from new monitoring solutions to cameras. Regardless how many consumers actually own 4K TV's, the deliverable requirements for just about everything that I've graded for the past 2 years has been strictly UHD or (in the case of Netflix) 4K DCI. 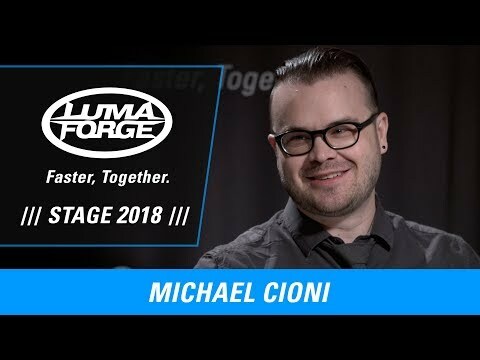 I definitely agree that Blackmagic created Blackmagic RAW with the intention to achieve higher resolutions while keeping the same media solutions. Remember RED uses proprietary media that they control to get 8K at their REDRAW compressions on to the media. Blackmagic RAW will allow higher resolutions at reasonable compressions. At the same time, this could be allowed to grant better vertical resolution and higher frame rates without going beyond 4.6K horizontal resolution. 6K as I said is acceptable, but 6K Anamorphic shooting requires a lot of pixels. Where is the Like button on the iPhone? Anyway, now I’m shooting with the 1.3x-65 Anamorphot, you have my support! Actually Nikon has taken its consumer 24MP, 6K sensor in the Z6 to get f4K UHD Video resolution, 10-bit output. The Next step 8K, is not that far off as an acquisition format as 4K display/exhibition becomes more available. But right now, 4K will handle the acquisition requirements for 2K and UHD delivery. Last edited by Denny Smith on Fri Nov 30, 2018 6:41 pm, edited 2 times in total. Ok, lets first talk about 4K before talking about 8k. Aside from Youtube and Netflix, do you see a lot of demand for a 4K material? As far as I know, and I know very little I admit, even cinema with all that resources are not making the vast majority of movies in 4K. Ok, they are doing a lot of 4K these days, but its not commom as per say. 2K is still what most deliverables are... delivered. Of course, as I said, I'm no expert so correct me if I'm wrong. 4K adoption is much slower than anyone thought it would be. Let alone 8K. I think when we do get to 4k as a norm, like 2k is at the present, it could have some kind of stasis, stagnation for a good long time. Ok, 8K would help resolution, reframing and stuff, but if you shoot correctly you will never need it. At least thats my feeling. People doing high end cinema are not asking for more resolution. Its already enough for the present technology. They would like more DR, colors and that kind of stuff. And without the nightmare of insanely huge files. Isnt 8k falling on that thought that "My videos/movies are better just because I shot on the latest gear"? Rakesh Malik wrote: The odds of any hybrids offering 8K VIDEO in the near future are pretty low. Panasonic is committed to 8K with a very aggressive timeline. I think they've talked about 8K in a hybrid by 2020. 8k from a bayer sensor won't give you 8k RGB or YUV output. It's like people just love marketing ********, buy a $1000+ phone and you're happy, buy an 8k TV and you will be happy for the rest of your life for the next 2 hours. A 4k BMPCC4k will give you 2.9k output in the best case scenario with a normal de-bayering algorithm or 3.2k with an algorithm that takes ages to produces 1 frame. The most famous camera companies in the world like ARRI(ALEXA65), SONY(VENICE) and CANON(C700) are not stupid, they all made a 6k camera for 4k delivery as did Kinefinity. And yes ARRI made the LF for Netflix, just to give in to the marketing hype. Ulysses Paiva wrote: 2K is still what most deliverables are... delivered. […]I think when we do get to 4k as a norm, like 2k is at the present, it could have some kind of stasis, stagnation for a good long time. As I mentioned, it's been a while since I was asked to deliver a master at anything less than UHD. Distributors ask for that format even if the footage was shot in HD!?! There is definitely a disconnect between what the industry deliverables are vs. what consumers are actually watching on. I don't even own a 4K tv and I'm not sold on how getting one will improve my viewing experience (HDR is a different thing though). However in my capacity as a colorist, it's 4K all the way. Since I also do come from an audio background, this does feel a lot like when people ask for 5.1 mix. I do happen to have a 5.1 system set up in my house, but among all of my other director friends, I'm the only one. I would venture and say that less than 1 in 100 households actually has 5.1 set up in their home. Yet 5.1 is the standard for audio delivery, even for straight to VOD distribution! The amount of vignetting yiu get depends on the lens, more obvious on less expensive lenses which have an optical vignette issue, thst is auto corrected by MFT still cameras. Better lenses like the Oly Pro series or Pana Leicas will not have obvious vignetting, perhaps a slight darkening by 1/3 EV or so, in the corners. But this is not sensor vignetting, it is thelens design, which is not holding even illumination towards the edge of its projected image circle, which lands very close to the corners on the new BM Pocket 4K. Ulysses Paiva wrote: Isnt 8k falling on that thought that "My videos/movies are better just because I shot on the latest gear"? Sometimes this all feels like a repeat of the megapixel wars of stills cameras. Ulysses Paiva wrote: People doing high end cinema are not asking for more resolution. Its already enough for the present technology. They would like more DR, colors and that kind of stuff. And without the nightmare of insanely huge files. They're asking for more than 4.6K, yes. They're using 6.5K or 8K now, have been for a while. Point is, if BMD wants to sell a new camera, and sell it for 5 figures USD, they're going to have to sell higher resolution because that's where the competition has already been. If you're designing a camera now, you have to design what people who are shopping for cameras in the future will want. Anyone satisfied with 4.6K will have already be satiated by the existing lineup. If the sell an 8K "lite" camera that has 4K video only, they might be able to do that for less than 5 figures and THAT would be something groundbreaking. And don't forget that higher resolution CAN result in more DR or color gamut. You don't have to use RGGB Bayer pattern if you have enough pixels. You can get a lot more interesting. MishaEngel wrote: A 4k BMPCC4k will give you 2.9k output in the best case scenario with a normal de-bayering algorithm or 3.2k with an algorithm that takes ages to produces 1 frame. I'd love it if Resolve worked that way. Input a 4K DNG, output a 2.9K RGB or YUV image. Especially if more of the processing (like cropping and rotation) was handled on the raw data. As said already, if it's another Bayer pattern sensor, I'd rather 6K. You can output it to 8k, it just gets very soft. The idea is to save processing, memory, and storage by demosaicing to a smaller raster than the raw input. They're asking for more than 4.6K, yes. They're using 6.5K or 8K now, have been for a while. I don't know anyone that's even asking for 4K much. Certainly no network TV is. Netflix ET AL is only asking for 4K in their own commissioned work (AKA Netflix Originals) but they will happily buy your 1920 content from you and air it (as they already do for several shows I've shot). I see 4K plus as being pretty specialist and niche. Some high end VFX oriented studio films, and even then, for VFX elements more so, and some specialty programming like electronic bill boards etc (again pretty niche). What is the business case that's TRULY driving this 8K content ? We're barely there for 4K delivery. Can you please share how you can get any MEANINGFUL advantage in DR or gamut ? Because I presume you get the same advantage going from 1920 to 4K ? and frankly, that's not anything near what I'd call meaningful. John Brawley wrote: What is the business case that's TRULY driving this 8K content ? We're barely there for 4K delivery. We've only had requests for 4K delivery for digital by clients where it made no sense. I guess they want to feel like they're getting their money's worth. Lets forget 8k capture for a moment - There's a good reason for using ultra high resolution scanning when digitising old film stock as it avoids 'grain aliasing' i.e it cleanly resolves the grain/dye structure of the film making it more real and less digital. Anybody who has scanned film for stills will know this and that you needed to scan at much higher resolutions that the intended output or infact the optical capability of the capture system to get a good image that was as good as traditional analog projected print output. I am finding this thread very interesting but a little distressing....you mean I shouldn't be delivering 4K from my UMP? and that its more suited for a final 2-3K iso output? MScDre wrote: I am finding this thread very interesting but a little distressing....you mean I shouldn't be delivering 4K from my UMP? and that its more suited for a final 2-3K iso output? And not all 4K cameras are actually 4K recording/output. Many cameras labeled “4K” are in fact UHD, not full 4K. I agree with John B, you shoot the acquisition resolution you need to get the deliverable resolution required. Today, 4K or even UHD is going to work for 2K or HD productions. If you need digital special effects then shoot a higher resolution. You get the camera that meets your needs today. Worry about tomorrow when it comes. What is the business case that's TRULY driving this 8K content ? BMD doesn't need a business case for content, they need it for hardware, and the competition is all doing more than 4.6K. Sony, ARRI, RED, Panasonic, Canon, etc..
BMD might not see feasibility for a $5000 8K camera, but at $20000, they might. There's a lot of methods out there. You could replace one of the green photosites with a white one, which would allow better low light signal. You could replace alternating RGGB quads with something like YCCM for expanded color space. You could add a ND filter on some photosites to capture highlight detail. You could use different micromirrors to generate depth. Stuff like this becomes practical when you have far more pixels/photosites than you need in our output image. Don't sweat it Kays, idiots, and most of the comments here are mistaken except for ones like David and Chad's. The data rates are small compared to modern memory busses. Storage I supassing even uncompressed requirements. Cinemartin Fran 8k is designed to record 8k to flash unconpressed. People with good idiom actually see in 8k, loosers without good vision Whine about it, and oh don't they love to Whine to look significant wanted loved rather than earn that respect by arguing something actually useful. So over sampling helps to render the delivery format more reliably, and according to some, preserves the lens shaping of the image cinetographers love. So, they are talking about 16k+, and holographic filming will be many times that. One reason for the sort of 4x oversampling is the dumb inadequacy of raw Bayer. Using vertical color filtering you could get better results at a lot less increase in resolution. A few CES's ago ambarella announced a consumer level 8k camera chipset. I expect next CES will be a lower powered version with 400-600mb/s h265 maybe, even some h266 mode as well. It's possible it could be done version with 800mb/s+. NVIDIA integra arm has had enough camera processing power for 8k for years, the now old chip has 1600mb/s h264, and enough processing power likely to be able to do an 8k cineform raw replacement video codec (GoPro uses on stills) even in professional 8k 60fps in a mini like camera The nvdia board is credit card sized. On the latest processing platforms they could probably handle 16k, even on less than top card (but development is only as good as the developers ussually). I don't see black magic raw as superior with its jpeg technique and samples, but built down to a price. Red's technology is probably licensed from cineform, so much stuff under 4:1 is likely effectively lossless, 8:1 maybe visually lossless, like high end ProRes, you might conjecture. It is probably pretty high end. CDNG is based on jpeg. You can get lower datarate and higher speeds by simply sacrificing detail under jpeg. By sculpting other parts of the image you can preserve a feel suitable for low grade distribution (which you could say cinema is at 4k in their tight datarates) as I and ambarella are aware of. 8k is a product that could have come out more than 10 years ago professionally, even earlier. In 2007 NVIDIA was trying to push release of a 8k like resolution as an industry standard, with 8k like modes on high end GPU cards. 8k displays and panels have been shown in recent years (I think the first 8k camera I heard of might have been 2003 or so, but forget). Anyway, a 8k+ still is still an 8k+ camera, and they have been bought for a while. Now, the Toshiba pure veiw sensor used in the old Nokia phone, was effectively uhd like 8k, good for the day, 8k pixels used to produce it's FullHD video to better quality (they actually went into details about this). A large reduction in noise effect was had. The industry has been holding off 4k and 8k for marketing and cost reasons. While FullHD was a hurdle in the older days, eventually when it became cheaper, it went mass market, as 4k has now on the screen size. But they seem to now want to wait for things to become so cheap, ambarella becomes market leaders, while they make money drip feeding minor updates and standards to the older generation. Likely to raise their profit margins, by producing cheap to make hardware. If a sub $100 media player can handle 4k you can be reasonably certain 8k is not likely to be 4x$100. The difference between 720p panels and FullHD panels was not much after a few years. The price difference between FullHD and 4k is also likely not much. Once new 8k display production lines are paid down there will be likely little disappointed deference between producing an 4k or 8k display, they use about the same materials, but in different ratios (more cell walls etc) but more cost to produce and verify. Somebody could perhaps produce an 8k TV now for 20% more than a 4k 65 inch (using 4k 32 inch panel tech X 4), or around 80 inch using around 40 inch panel tech. 50-55 inch maybe the cheapest to use, but that would be up to 100 inch. The larger sizes have freighting and installation cost issues. But, 4k 24 inch monitor tech might yeild the cheapest in a 48 inch screen (mind you, I don't want another TN LCD TV). A descent monitor tech would have to be used. But an high quality 8k head mounted display could be done under $500, and eventually $200, and out do most TV and cinema experiences. Even putting a mid range phone in a headset could do that. People who can see in 8k will get benefit, but even those who see in 4k should get benefit. Those who see in 2k or 720p, not so much. I love the texture of details, which needs contrast consumer codecs try to decrease. So, the low-end of the industry has been drawing out its resolution upgrades. Toshiba had 8k sensor ages ago on small sensor, and there was to be a 4kp50/60 phone that got cancelled. Others had 6k small sensors years back rather than progress to 8k. A number of these higher than 4k resolution mobile sensors are designed to pull the full frame off at video rates. More modern versions of the micro studio sensor have something like 18mp at 70fps speed, but maybe that was the 1/2.3rd small sensor. The other sensor still was video rate. At least one of them was 1 inch Now, that was 2013/14 I think. Ambarella has chip sets that pull high speed, likely cheap. Now I remember. Even though BM could even make an 8k pocket camera, the way they make cameras I imagine a 6k mini and a 8k ursa are possible. I don't expect them to make cameras as compact as the application specific circuit competition, or anybody using NVIDIA's latest embedded chip, or top end mobile chipset. In fact, unless there is a FPGA solution out there that can cheaply handle 8k, I don't expect to see an FPGA solution in the mini at next nab. If the FPGA technology is stressed by the meager 8k datarate, then it may well run hot or and require multiple FPGAs in parrallel, more suiting an bigger ursa. And people shouldn't be wedded to the idea that they need to use the same sized pixel as in the present 4.6k, they can go UHD at Super 35mm and maybe produce the same performance as the 4.6k does at the moment. The 4.6k sensor technology is a number of years old now, and newer technology would be available to upgrade it by now. It could even be that they go with the latest 6k and 8k capable Sonies they can get. But I advise them against depending too much. Years ago, I read Sony was known as the Ninja of Japanese electronics in Japan. I have a few copies of Sun Tzu's, The Art if War, I have been meaning to read which BM could read. It is a historical text used in warfare and Asian business. One strategy is apparently to get you dependent on the opposition so they land up with everything while you are left with nothing, as they do you a deal. Imagine if you give up what independent ability to let somebody's st else do it for you, then things change. BM paid a lot for the 4.6k technology, and I think they, hopefully, should get their monies worth out of it, and cultivate the sensor relationships competitively. They have multiple progressive sensor vendors and multiple camera lines to put different sensors into. Depending on competitor's own supply networks is maybe not desirable. The only higher end "pro" oriented camera BMD made was a failure. No one wanted it. Not enough people bought it to justify its continued development. I can't SEE BMD EVER selling a camera for 20K. That's not their customer base. Not sure if you've noticed but they aren't chasing high end customers. So actually theoretical ideas, something that isn't existing and proven today, and also, only for delivering supersampled delivery resolutions. Again, I don't see BMD doing this kind of leading innovation. They're great at existing for less. Not new for more. John Brawley wrote: I can't SEE BMD EVER selling a camera for 20K. That's not their customer base. Not sure if you've noticed but they aren't chasing high end customers. An 8K camera for $20K isn't high end. A 6K camera for $45K is. And while BMD may not have ever sold a high end camera, they do make other equipment that is closer to high end than it is to prosumer. Like the 8K Decklink. Or Ultimatte. Or Cintel. Or the Fairlight panels. A $20K camera wouldn't even be in the top 5 highest priced SKUs for BMD. It's like how I'm surprised that BMD hasn't started selling a VR or light field camera, considering they have all the parts to make such a thing, and they could sell it for $40K and I'd buy one tomorrow, because the alternatives are so much more. And there's such a thing as a halo effect. Just like most Resolve users won't ever sit in front of $30K Resolve panel, but it makes the $3K and $1K panels look really good. John Brawley wrote: So actually theoretical ideas, something that isn't existing and proven today, and also, only for delivering supersampled delivery resolutions. Theoretical? No. Millions of sensors shipped to date? Yes. Sony has been shipping their dual exposure quad Bayer sensors for quite a while, and I can't name a single CMOS manufacturer that exclusively ships 2x2 Bayer CFA sensors. Just read the press release, It's clearly aimed at a higher end market than their current cameras. An 8K camera for $20K isn't high end. A 6K camera for $45K is. 20K is a lot more than BMD have ever charged for a camera. They don't want to make cameras that might need more than a credit card to buy. You're not getting their business model. Chad Capeland wrote: Theoretical? No. Millions of sensors shipped to date? Yes. Sony has been shipping their dual exposure quad Bayer sensors for quite a while, and I can't name a single CMOS manufacturer that exclusively ships 2x2 Bayer CFA sensors. Tell me which photographic camera or motion imaging camera there is that users a super sampled sensor to achieve what you have claimed. Higher DR, greater gamut. I'm just trying to truly understand the case for 8K because on resolution alone, I don't see much of an upside. I'd much much rather have bit depth, a global shutter with the same current DR and noise performance over more resolution. Chad, I know what you are talking about with those alternative color filter arrays, except the wider color gamut example, which one was that? I also would like to know his greater resolution gets more DR and color gamut. I did calculate that downscaling from 8k to 4k, gives you a little more dynamic range ability in some circumstances, due to the accumulative values of sub pixels giving extra levels of values, and have seen talk about that since out there. 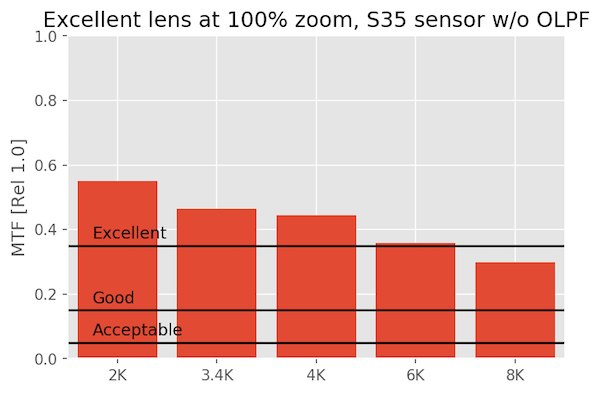 But, compared to a native 4k sensor for the same bit depth it should be no more range, but maybe some more levels. On a flat one colour surface with even brightnesses it should be nothing, but with variation in detail, the sub pixels could discern different brightnesses and be interpreted as an averaged in between value.